The final eight teams in the 2017 NCAA Division 1 Softball season will be playing for the chance to win the Women’s College World Series with an updated bracket here. Each game of the 2017 Women’s College World Series will take place from ASA Hall of Fame Stadium in Oklahoma City, Oklahoma. The 8 teams will compete in a double elimination format until only two teams are left. Those two remaining teams will then play in a best of three championship series to determine the 2017 National Champion. The Oklahoma Sooners are the defending National Champions and return after a taking the difficult road in the first two rounds. They lost their Regional opener against North Dakota State and had to battle back by winning four straight elimination games. In the Super Regional they had to go to Auburn and they won the first two games to book their spot back in Oklahoma City. Results for the Regional round can be found here and the Super Regional round can be found here. Of the eight schools, all of them have made a previous appearance at the WCWS and the field includes Florida, UCLA, and Washington. All eight teams are listed below with only Texas A&M (2008) not having made an appearance in the previous four seasons. The Women’s College World Series will get underway on Thursday, June 1 with four games scheduled for the opening day. The entire schedule can be found in the table below with the Championship Series located in a separate table. The tables below will be updated with final scores as the games go final each day. Please note all times listed below are Eastern. ESPN #5 UCLA #9 Texas A&M 8-2 Texas A&M Elim. ESPN #3 Oregon #15 Baylor 7-4 Baylor Elim. ESPN #6 Wash. #5 UCLA 1-0 UCLA Elim. ESPN #13 LSU #3 Oregon 1-4 LSU Elim. ESPN #1 Florida #6 Wash. 5-2 Wash. Elim. The 2017 NCAA Division 1 Softball Tournament has been pared from 64 teams down to 16. The national seeds were in good form as all 16 made it to the Super Regionals with an updated bracket here. There will be 8 best of three matchups in the Super Regional round with the games slated to take place between Thursday, May 25 and Sunday, May 28. Below is a list of the 16 teams that made the Super Regional Round. Below, we list each Super Regional in order of the potential Women’s College World Series matchup (1 v 8, 4 v 5, etc.). All dates and times listed below are tentative. Updates, along with final scores, will be made as the changes are known. 5/27/17 Game #2 1 PM #7 Auburn #10 Okla. 2-5 Okla. The 2017 Women’s College World Series will take place between Thursday, June 1 and Wednesday, June 7 with every game shown on one of the ESPN family of network channels. All of the games will take place at the ASA Hall of Fame Stadium and OGE Energy Field from Oklahoma City, Oklahoma. With the 2017 NCAA Division 1 Softball Tournament about to start, it is time for some predictions. We have four predictions below, which are a combination of some likely and unlikely scenarios. As noted prior to the start of the 2017 season, it has been five years since a team outside of the top 16 national seeds has meandered their way to the Women’s College World Series. Back in 2012, LSU and South Florida were the two teams who went to the WCWS as unseeded squads. Who will be the teams this year? There are actually plenty of candidates starting with Minnesota. They were completely disregarded by the Selection Committee and sent to the top quadrant. They have a road trip to the Tuscaloosa Regional followed by a probable three game set in Gainesville if they can make it out of the Regionals. That will be a very tough test for the Gophers. How about Louisiana-Lafayette? They too were ignored by the Selection Committee, but at least they stay within the state. They go to #13 LSU and they could conceivably win that Regional. A big hurdle is the potential Super Regional against Florida State, but the Ragin’ Cajuns have the bats to knock some big names out of this tournament. The #6 and #11 quadrants have probably the highest potential to send an unseeded team to Oklahoma City. #11 Utah has to face three solid teams in Fordham, Mississippi State, and BYU. #6 Washington welcomes a surging Fresno State team, Montana, and a Michigan. The Wolverines know all about making the WCWS as they have reached that destination three of the last four years. Could there be a bigger shock in store in the Regional and Super Regionals rounds? Or will the national seeds hold sway and make it to the Super Regional round? Stay tuned to find out. This is hardly going out on a limb, but the Gophers will be determined to show the Selection Committee how badly they messed up. Minnesota’s pitching led by Sara Groenewegen, who is 30-2 with a 10-1 strikeout to walk ratio. She has struck out 280 batters, allowed 28 walks, and has an ERA of 0.59. The Gophers main competition will be Alabama, but they must make sure not to overlook Louisiana Tech in the opening game. Alabama is a team that has struggled to score runs this year averaging just 4.40 per game, which ranks 121st in the nation. The pitching and defense are stellar at 10th and 12th respectively. The Tide have only scored more than five runs four times since April 1, but consider their opposition they achieved that against: Missouri, Lipscomb, UAB, and Samford. Alabama may not be as lucky to survive a close game against Minnesota if the offense continues their struggle. This is somewhat similar to the first prediction and this also has not happened since 2012 when UCLA lost to Hofstra and Florida State in back-to-back games as the 12 seed. Before that, it was Northwestern in 2009 that lost their first two games to Texas State and Louisiana-Lafayette also as the 12 seeds. The reason this rarely happens is because the seeded teams face the lowest seed in the region for the opener, which is almost always weaker opposition. On paper, this year is seems no different as most of the national seeds look likely to win the opening game, but this tournament is pretty deep especially if the selection committee mis-seeded more teams than just Minnesota. We think at least one or two teams might be able to scratch out a close victory over a national seed in the first game (DePaul, Fordham, Albany, Southern Illinois, or Kent State?) to give this prediction a chance of coming true. Since 2001, no team outside the top 6 National Seeds has won the Championship. That happened in 2008 when Arizona State won the National Title as the #6 seed and only once has a double digit seed even made the Championship or Championship Series. Arizona did so in 2010, but were swept in the Championship Series. It is likely that the champion will once again be from the top 6 of Florida, Arizona, Oregon, Florida State, UCLA, and Washington. We will also include #7 Auburn, last year’s runner up, and #8 Tennessee, a team that has the ability to go on a run to win it all. Two teams outside the top 8 who definitely could win the title are #9 Texas A&M and #10 Oklahoma. The Sooners are the defending National Champions and could eliminate Auburn once again if the two meet up in the Super Regional round. Even a team like #12 Ole Miss could pose problems if they continue to play like they did in the SEC Tournament. Still, we think the winner is likely coming from the top of the seeding even in a tournament as strong as this year’s. Florida’s defense and pitching, Arizona’s offense and pitching, and Oregon’s late season sweep of Florida State (another strong contender) all look poised to lift the trophy. Just two days after being snubbed by the NCAA Tournament selection committee, Minnesota took over the the top spot in the Coaches Poll. 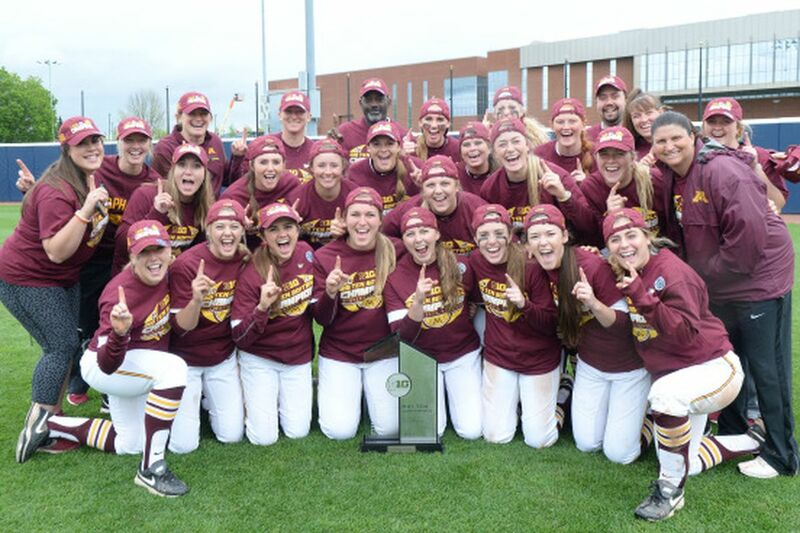 The Gophers remained third in the ESPN.com/USA Softball Poll. The Gophers claim 18 of 32 first place votes in the Coaches Poll with Florida dropping a spot to second and taking 12 first place votes. Oregon is third with the final two first place votes while Florida State and Arizona round out the top with neither team moving in the poll. The Seminoles won both the ACC and Regular Season titles while Arizona were crowned Pac-12 Champions. Oklahoma, the Big 12 Regular Season and Tournament champions, remains sixth while Washington (seventh) and Auburn (eighth) swap positions. Also switching spots in the polls are UCLA (ninth) and Tennessee (tenth). CAA Champions James Madison are up one spot to 11th, Texas A&M is down a spot to 12th, and Ole Miss rockets up six places to 13th after winning the SEC tournament. Sun Belt Champions Louisiana-Lafayette (14th) and Alabama (15th) stay in place from last week’s rankings. Utah is down three spots to 16th, Baylor is down a spot to 17th, and LSU is up three spots to 18th. Kentucky drops one place to 19th and rounding out the top 20 is Michigan, who fell three places. BYU, winners of the West Coast Conference Regular Season Title, is down one place to 21st, Arizona State stays at 22nd, and Tulsa makes an appearance at 23rd after winning the American Athletic Conference. They were unranked last week and take the place of Marshall. South Carolina and Georgia remain at 24th and 25th respectively. The entire Coaches Poll can be seen below. 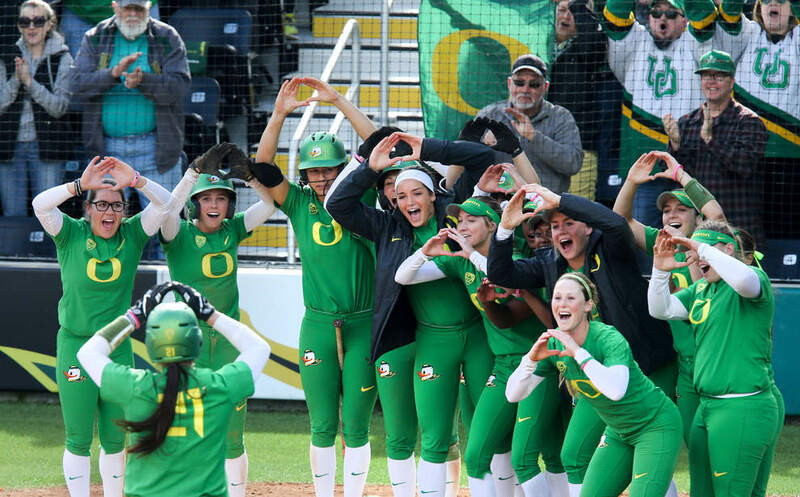 In the ESPN.com/USA Softball Poll, Oregon jumps ahead of Florida to claim the top spot. Oregon received just five of the 20 first place votes while Florida took nine. Third through fifth stay the same with Minnesota (five first place votes), Florida State, and Arizona (one first place vote). Oklahoma stays in sixth and Washington is up two spots seventh. A tie for eighth place occurred between Auburn (no change) and UCLA (up two spots). Tennessee is down three places to tenth. There was not much change between 11th and 15th as Texas A&M stays at 11th, James Madison (12th) and Baylor (13th) switch spots and another tie occurred at 14th. Alabama (up two spots) and Louisiana-Lafayette (up one spot) tied on 228 points to round out the top 15. Ole Miss went up just two spots in this poll to 16th, Utah fell three to 17th, and Michigan was down one spot to 18th. 19th belongs to LSU (up two) and Kentucky is down one to finish out the top 20. The bottom of the poll starts with BYU in 21st (down one), Arizona State (no change), and Tulsa (up one). South Carolina is 24th and the 25th place resulted in a third tie of this poll. Ohio State (down one) is joined by South Carolina Upstate for the final spot. The Spartans are ranked for the first time after winning the Atlantic Sun Regular Season and Conference Titles. The entire USA Softball poll can be seen below. Below are the polls from earlier in the season. The 2017 NCAA Division I Softball bracket is now known and the bracket can be found here. The Oklahoma Sooners are the defending National Champions after defeating the Auburn Tigers in the 2016 WCWS Championship Series. The Florida Gators are the top overall seed followed by Arizona, Oregon, and Florida State. The tournament will get started with the regionals between Thursday, May 18 and Sunday, May 21. Below are the 16 National Seeds as ranked by the NCAA. Below are all 64 teams that have made the 2017 NCAA Division 1 Softball tournament. In the sortable table below, the automatic bids are listed first followed by the at-large bids listed in order of conference. The records for each team and which regional they have been assigned to are provided as well. The 2017 NCAA Division 1 Softball tournament will start with 16 regionals divided into four teams per regional. Each regional employs the double-elimination format with the 16 national seeds listed above hosting a regional. The regionals are listed in order of the potential Super Regional matchup (i.e. #1 vs #16, #9 vs #8, #13 vs. #4, etc.). All dates and times listed below are tentative. Updates, along with final scores, will be made as the changes are known. 5/19/17 Game #1 12 PM Okla.
5/20/17 Game #3 12 PM Okla.
5/20/17 Game #5 5 PM Okla.
State Fla. Int'l 5-0 FIU Elim. 5/21/17 Game #6 12 PM #1 Florida Okla.
5/21/17 Game #6 5 PM #16 Alabama Minnesota 1-0 Minn.
5/21/17 Game #6 2:30 PM #9 Texas A&M Texas 3-1 Texas Elim. Fullerton Lehigh 10-8 Lehigh Elim. Fullerton 9-1 Cal State Fullerton Elim. State North Carolina 2-3 Arizona St.
5/18/17 Game #1 6 PM Miss. 5/19/17 Game #4 5:30 PM Miss. 5/19/17 Game #2 4:30 PM E Tenn.
5/20/17 Game #4 5 PM E Tenn.
5/21/17 Game #6 2:30 PM #7 Auburn Cal 8-2 Cal Elim. 5/22/17 Game #7 1 PM #10 Okla. Tulsa 3-0 Tulsa Elim. 5/20/17 Game #4 7:30 PM New Mexico State St Francis 4-8 New Mex. 5/21/17 Game #6 7 PM #2 Arizona South Carolina 9-0 South Carolina Elim. The Super Regional round of the 2017 NCAA Division 1 Softball Tournament will be a best of three series between the dates of Thursday, May 25 and Sunday, May 28. The campus sites for each Super Regional will be determined upon completion of the Regionals by the NCAA. The 2017 college softball regular season is over for most teams across the country following week thirteen. There were some big games and upsets among the top teams in our final regular season power rankings. We take a look at the top 16 teams in our power rankings as well as the next four teams. We will start by providing last week’s rankings below. Please note the records in the table below are as of May 2. Below are the previous editions of our Power Rankings. Below is the ninth edition of our 2017 power rankings. Please note the records listed are through games as of May 9. Florida (#1 last week) went 4-1 with the week beginning with a loss to Florida State. The Gators had their best ace in the circle with Kelly Barnhill, but despite the 21 strikeouts, they lost 3-1 in 11 innings. Florida finished the week going 4-0 over North Texas and Florida A&M by a combined score of 32-1 with only 13 hits allowed. The Gators will play in the SEC Tournament this week as the top seed. Oklahoma (#3 last week) went 3-0 with a sweep of Oklahoma State in which they allowed only one run during the series. The series ended with a combined no-hitter from Nicole Mendes and Paige Lowary. The Sooners are playing their best ball of the season right now and they will be the top team in the Big 12 softball tournament. Oregon (#8 last week) makes a big move up after sweeping Florida State at home. Game one was an 11-0 final as seven different Ducks recorded an RBI and Megan Kleist allowed only two hits. Game two was a Maggie Balint three hitter with the Ducks scoring three sixth inning runs to win 3-1. The finale was tight throughout as FSU took a 1-0 lead in the second and Oregon tied it in the fifth. The bottom of the ninth saw Danica Mercado’s lead off double turn into the game winning run as Gwen Svekis hit a sacrifice fly to walk off for the win. Oregon looked fantastic in sweeping the Seminoles and have the look of a national title contender. They have one final series at Stanford to close out the regular season. Minnesota (#4 last week) had a great week going 3-0 over Penn State en route to capturing the Big 10 regular season title. The Gophers won each game by at least 9 runs and by a combined score of 35-3. 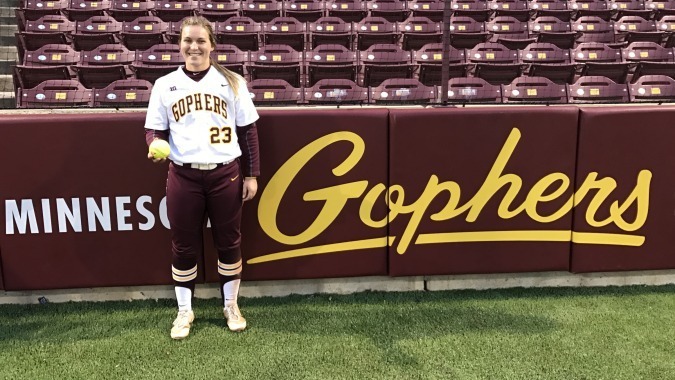 Sara Groenewegen threw one hitters in the first and third games as the Gopher pitching staff allowed six hits over the three games. The Big 10 conference tournament is on deck for Minnesota. Florida State (#5 last week) went 1-3 this week, but they took on a couple of the top teams in the nation. They won the midweek game at home to Florida 3-1 in nine innings. They overcame 21 strikeouts from Kelly Barnhill as the walk off home run was hit by Alex Powers. The road trip to Eugene was not very successful as they were swept by Oregon. They were completely dominated in the opener losing 11-0, but were much more competitive in the final two losing 3-1 and 2-1 with the latter coming via walk off. It is hard to fault the Seminoles for taking on a tough schedule and their win over Florida keeps them here. They will be playing in the ACC Tournament this week as the top team. Arizona (#2 last week) finished the season going 1-2 against UCLA in a three game set. Despite the series loss, the Wildcats won the Pac-12 Regular Season title and the Pac-12 automatic bid to the NCAA Tournament. Arizona was shut out twice to open the series before roaring back to win the finale 7-2 with four first inning runs. The Wildcats do not have a series this weekend as they await finding out their national seed for the tournament. Arizona will undoubtedly be a top 8 team, which guarantees them hosting both a Regional and Super Regional should they get past the first round. Tennessee (#9 last week) played a three game series at Texas A&M and came away with two wins. The Vols did not get much going in a 5-1 loss to open the series, but came alive on offense scoring 8 runs in each of the final two games. Six different Vols recorded an RBI in game two while Meghan Gregg had 5 RBIs in the third game. Tennessee is a dangerous team going into post season play, which begins this week for the Vols with the SEC Tournament. UCLA (#12 last week) took two of three from Arizona at home. It was an impressive first two games as they shut out the Wildcats and allowed seven hits over the two games. They did not fare so well in the third game losing 7-2, but they had already taken the series. UCLA continues to be one of the most enigmatic teams this season. They have won the first two games of three game series versus Washington, Oregon, and Arizona, but also have a series loss to Oregon State. There is no doubt UCLA is talented enough to beat any team when their hitting and pitching is on at the same time, it is just a matter of if those two happen at the same time. The Bruins are at Arizona State this weekend for one final series. Texas A&M (#6 last week) dropped two of three against Tennessee at home. They started well with a 5-1 win before the pitching gave up 16 runs on 22 hits over the final two games. The Aggies have hit a bit of rough patch losing four of their last six going into the SEC Tournament. Washington (#7 last week) had a 3-1 week winning over Seattle on Wednesday and taking two of three from Stanford at home. The Huskies were in a battle in game one against Stanford, taking it 1-0 on a walk off home run from Kirstyn Thomas. Game two was the same for Washington in the fact they had a tough time scoring. They were one hit in a 6-0 loss before bouncing back to win 10-2 in game three. It is a bit odd that the Huskies struggled with Stanford, a team that had only one Pac-12 win coming into this series. They have another tough opponent in Utah this weekend to end the regular season. Auburn (#11 last week) went into rival Alabama’s place and took two of three. It was their first series win in Tuscaloosa in program history. Each game was tightly contested as they needed 9 innings to win the opening game 3-0 and then won 4-1 in the second game behind Alyssa Rivera’s three run double. The Tigers had their chances to sweep Alabama in the final game as they loaded the bases in both of the first two innings, but came away empty. Haley Fagan hit two solo home runs, but it was enough as they lost 3-2. Auburn is hungry to avenge last year’s loss in the WCWS Championship Series and their next step is the SEC Tournament this week. Louisiana-Lafayette (#13 last week) went 3-0 thanks to a sweep of in state foe Louisiana-Monroe. They posted two four hit shutouts and also won a close 6-5, which they led 6-0 after three innings. The Ragin’ Cajuns have the Sun Belt Tournament this week as they loom a very serious threat going into the NCAA Tournament. Baylor (#13 last week) took two of three from Texas to close out the regular season. Game one was a 2-1 victory as Kelsee Selman allowed two walks and four hits in a complete game. Game two was a 3-1 loss as the Bears gave up three runs in the bottom of the fifth. Baylor won the third game 4-0 with Ari Hawkins driving in three runs. Baylor will be in the Big 12 Tournament this week. Utah (#10 last week) lost two of three to Oregon State on the road. The opener was a 5-0 loss as Taylor Cotton one hit the Utes. Utah was only able to muster two hits in a 3-1 game two loss before rebounding for a 6-0 win in the finale. Kay Kay Fronda and Anissa Urtez both recorded 2 RBIs. The regular season ends with a three game series against Washington. James Madison (#15 last week) ended their regular season with a sweep of Elon. They won the three games by a combined score of 22-3 as Megan Good won all three games to improve to 34-1. Jessica Mrozek recorded 5 RBIs while Taylor Newton had 4 RBIs. The Dukes will be the top seed and host of the Colonial Athletic Association Tournament. The Wolverines (#16 last week) ended their regular season with a fantastic sweep of Rutgers by a combined score of 45-2 over the three games. The finale was a combined no-hitter between Megan Betsa and Tera Blanco with Betsa striking out 17 over the her two starts. Michigan is rolling into the Big 10 tournament, which will be held at their home field. Ole Miss (#17 last week) wrangled two of three from Missouri on the road, which can be a difficult place to win at. They opened with 6-0 and 12-4 wins as Kaitlin Lee threw the opening game shutout allowing one walk and four hits. Game two was dominated by Ole Miss’ offense between Courtney Syrett (4 RBIs), Dylinn Stancil (3 RBIs), and Kylan Becker (2 RBIs). The Rebels nearly had the sweep, but gave up the tying run in the seventh and walk off run in the ninth inning of the finale. They will be in the SEC Tournament and kickoff against Mississippi State. BYU (#20 last week) continued their tear through the West Coast Conference going 6-0 on the week and 3-0 in conference. The sweep gave them their fourth straight West Coast Conference title and the automatic bid. They opened the week with a 6-0 win over Grand Canyon thanks to a two hitter by McKenna Bull where she struck out 9. They swept Santa Clara on the road. The first two games were 5-0 and 3-1 wins while the final game was a 19-5 destruction with 11 first inning runs scored. Ashley Thompson and Libby Sugg both had 4 RBIs in the game. BYU finished the week with a 10-2 win over Utah Valley and a 4-1 victory over Utah State. The Cougars will have one final series at St Mary’s before the NCAA Tournament begins. Alabama (#18 last week) lost two of three to rival Auburn at home. They lost the opener 3-0 in nine innings and 4-1 in game two. They came back to win the finale 3-2 to salvage something against their rival. Alabama is 9-11 in their last 20 games going into the SEC Tournament where they open with Arkansas. LSU (#19 last week) went on the road and lost two of three to South Carolina. All three games were decided by two runs or less. LSU’s offensive production was quite even as only two players (Emily Griggs and Amber Serrett) finished with multiple RBIs in the series. LSU opens with Missouri in the SEC Tournament. The duo of Oregon and Minnesota enjoyed a boost in the NCAA Softball polls after week 13’s action. The pair still trail Florida, who is number one in both polls. In the Coaches Poll, Florida took 22 of 32 first place votes as Minnesota (five first place votes) and Oregon (five first place votes) are close in tow. Florida State falls two spots to fourth after being swept by the Ducks and beating Florida. Arizona also drops two spots and round out the top five. Oklahoma stays in place at sixth, Auburn is up two spots to seventh, and Washington falls one spot to eighth. Tennessee is up two places to ninth after taking two of three from Texas A&M and UCLA is also up two spots after defeating Arizona twice. Texas A&M is down three spots to 11th, James Madison is up one place to 12th, and Utah is down three spots to 13th after losing two games against Oregon State. Louisiana-Lafayette is 14th and Alabama is 15th with those two teams switching places from last week. Baylor (up one) is 16th, Michigan (up two) is 17th, and Kentucky (down two) is 18th. Ole Miss moves up two spots to 19th and BYU stays in place at 20th. LSU falls three places to 21st, Arizona State stays at 22nd, and Marshall stays 23rd. The duo of South Carolina (24th) and Georgia (25th) round out the top 25 with both teams new to the poll this week. Arkansas and Tulsa both fell out of the Coaches Poll, which can be seen below. In the ESPN.com/USA Softball Poll, Florida is also #1 with 12 of the 20 first place votes. Oregon (up from fifth) is second in this poll with four first place votes while Minnesota (up one) is third with the final four first place votes. Florida State (fourth) and Arizona (fifth) both fall two spots. Oklahoma is up one spot to sixth after sweeping Oklahoma State. Tennessee (seventh) and Auburn (eighth) move up two spots each as Washington falls one place to ninth. UCLA is up two spots to round out the top 10. Texas A&M plummets five spots to 11th after losing two of three at home to Tennessee. The pair of Baylor and James Madison are up one spot to 12th and 13th respectively. Utah is down three places to 14th while Louisiana is up on place to 15th. Alabama is down a spot to 16th, Michigan stays at 17th, Kentucky remains in 18th, Ole Miss is up two spots to 19th, and BYU stays at 20th. LSU is 21st (down two spots), Arizona State moves up a place to 22nd, and South Carolina enters the poll at 23rd. The bottom of the poll sees a three way tie for 24th. Marshall, Ohio State, and Tulsa all received 27 points. Ohio State is the newcomer, replacing Illinois. The entire USA Softball Poll can be seen below. With conference tournaments taking place this week, the NCAA Tournament is just over a week away. 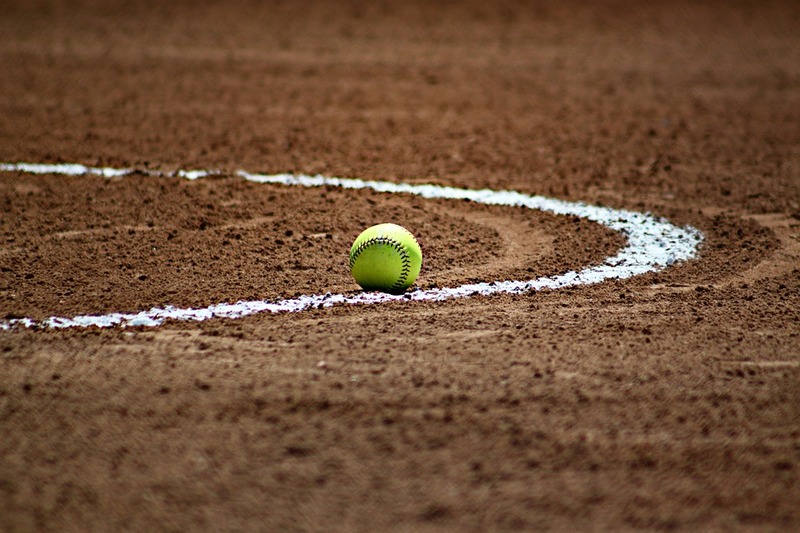 The regular season is coming to a close for the 2017 College Softball season, but there is still a chance for teams to make the NCAA Softball Tournament with a win in the Conference Tournament. Below are the tournaments for all conferences in NCAA Division 1 Softball. Four conferences do not have a post season tournament and instead will award their automatic bid to the regular season champion. Those four conferences are the Big West, Mountain West, Pac-12, and West Coast. The Big 12 opted to bring back their conference tournament after a six year hiatus. The regular season champion is included below for each conference because there are several cases where the top seed in the conference is hosting the tournament. In all, there are 32 automatic bids handed out while another 32 at-large bids will be determined by the Softball Selection Committee. One conference tournament that has already been decided was the Ivy League. Princeton defeated Harvard to win their second straight Ivy League Championship Series. As the conference tournament champions are crowned, the table above will be filled out. The conference tournaments listed above will help determine the field for the 2017 NCAA Division 1 Softball tournament. We will find out which teams made the tournament on Sunday, May 14, 2017 at 10 PM Eastern Time on ESPN2 with the Selection Show. The 2017 NCAA Softball Tournament will begin on Thursday, May 18, 2017 at 16 campus sites with the Regional round. The Regional round is contested in a double elimination format with each Regional having four teams. The 16 teams who win their Regional will move on to the Super Regional where they will compete in a best-of-three series to be held between May 25 and May 28. 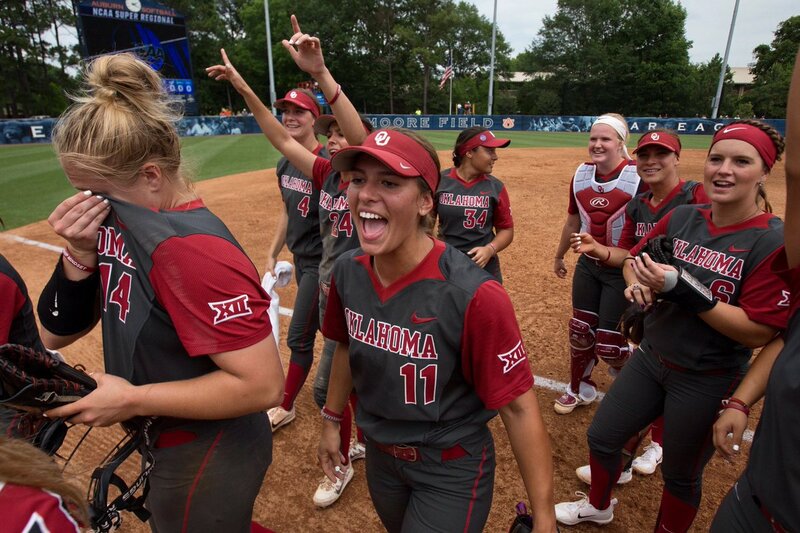 The 8 winners of the Super Regional round will move on to the 2017 Women’s College World Series to be played in Oklahoma City, Oklahoma starting on Thursday, June 1. The Championship Series will begin Monday, June 5 with a best-of-three format to determine the winner of the 2017 Women’s College World Series. Week thirteen of the 2017 college softball season is over as is the regular season for most of the teams in the country. With conference tournaments starting this week, we take one final day-by-day look at the regular season action on the diamond. #1 Florida and #2 Florida State met in Tallahassee with the Seminoles coming out on top in a great 11 inning battle. The Gators scored in the top of the first on Janell Wheaton’s single to left field. FSU tied the game in the bottom of the inning via Jessica Warren’s solo shot. The game remained tied at one until the bottom of the 11th inning when Korina Rosario led off with a triple and Alex Powers hit a two run walk off home run two batters later for 3-1 win. Kelly Barnhill suffered her first loss of the season after pitching 10 1/3 innings where she struck out 21. Texas-San Antonio swept Texas Tech in a doubleheader with 3-2 and 6-3 victories. UTSA got out to a 2-0 lead before Texas Tech came back with solo shots in the fifth and seventh innings from Devon Thomey and Raina O’Neal to tie the game. In the ninth inning, Celeste Loughman delivered her only hit of the game, which brought home the winning run. The Roadrunners won the second game thanks to a two run shot by Loughman and three RBIs from Bailee Baldwin. #6 Oklahoma won 3-0 over Oklahoma State to clinch their sixth straight Big 12 title. The Sooners did not score until the fourth inning on Macey Hatfield’s double field and then put up two more runs in the fifth on a single by Fale Aviu. Paige Parker went 5 1/3 innings allowing two walks and four hits with 8 strikeouts while Paige Lowary got her fifth save of the season with 1 2/3 perfect innings. #7 Washington won 3-1 over Seattle as Morganne Flores hit a three run home run in the third inning. Seattle got one run back in the fourth inning, but Samantha Manti shut the door on them with 3 2/3 perfect innings as she struck out five. Florida Gulf Coast split a doubleheader against Lipscomb. Game one was a 10-2 Lipscomb win as Destinee Brewer, Caitlin Plocheck, and Hannah Devault all recorded 2 RBIs. Game two was a 3-2 win for FGCU as they needed extra innings to get there. The Eagles led 2-0, but Chloe Yeager tied the game with a two run shot. Florida Gulf Coast won in the ninth inning on a single to left field from Bri Innamorato. New Mexico State won 5-4 over Florida Atlantic. FAU took a 1-0 lead in the top of the first before Nikki Butler hit a two run home run for the Aggies. Florida Atlantic took a 4-2 lead in the top of the fourth thanks to three runs, but NMSU tied the game in the bottom of the inning on Victoria Castro’s two run home run. Kelsey Horton drove home the eventual game winning run in the bottom of the fifth. Army posted two big wins over Siena on the road. Katie Ontiveros recorded 3 RBIs as Lacey Swafford and Sam Hartman both had 2 RBIs. Caroline Smith threw five innings of four hit ball in the 10-1 win. Game two saw Kristen West throw a one hitter in an 8-0 win. Alee Rashenskas and Amelia Trotter had 2 RBIs apiece while Gladys Esparza-Gallegos went 3 for 4 with 2 runs scored and an RBI. Furman won a pair of games over Chattanooga to take the series over the Mocs. Game one was a defensive battle with Chattanooga taking a 1-0 lead on Aly Walker’s solo shot. The Paladins came back in the fifth to score two runs on Casey Bingham’s two run single as Lindsey Bert threw a complete game allowing two hits with 11 strikeouts in the 2-1 win. Game two saw Furman take a 4-0 lead with four different batters recording an RBI. Emily Demonte got the win, her 10th of the season, and Bert came on for the save. South Carolina defeated #18 LSU thanks to a four run fifth inning. LSU took a 3-0 lead in the fourth as Emily Griggs hit a two run single. Alyssa VanDerveer brought one run home for South Carolina before they put up four in the fifth. Victoria Williams hit a two run double to make it 5-3 before LSU scored a run in the seventh, but it was not enough as South Carolina won 5-4. #21 Ole Miss had a pair of three run innings as they shut out Missouri 6-0. The Rebels were had just two baserunners in the first four innings, but broke through in the fifth and sixth innings with three runs apiece. Five different hitters recorded an RBI with Courtney Syrett recording two. Kaitlin Lee went the distance allowing one walk and four hits while striking out two. #9 Auburn and #14 Alabama needed 9 innings to decide a winner with the Tigers coming out on top 3-0. In the ninth inning, Auburn scored on an errant throw and then tripled the lead on Kendall Veach’s two run double to left field. Kaylee Carlson went all 9 innings allowing three walks and five hits while striking out three. Auburn drew 12 walks led by Kasey Cooper’s three and a total of eight different batters drawing at least one. Oregon State delivered a shock 5-0 shutout of #10 Utah. Oregon State started the scoring in the second inning on a single by Kayleen Shafer before a 4 run burst in the fifth inning put them well in front. Alysha Everett doubled home two runs and Lovie Lopez also had an RBI double. Taylor Cotton went the distance allowing only one hit and five walks. #12 UCLA posted a run rule victory over #3 Arizona. The first two innings were quiet, but they gave way to a lively final three innings. Kylee Perez opened the scoring with an RBI double and Brianna Tautalafua brought home two more runs on a double. A run in the fourth made it 4-0 before Madeline Jelenicki brought home another with a single in the fifth. The game ended with Bubba Nickles hitting a three run home run in the fifth for an 8-0 UCLA victory. #4 Minnesota clinched a share of the Big 10 Regular Season title with a crushing 11-1 win over Penn State. The Gophers scored 6 runs in the first two innings and cruised the rest of the way. Both Kendyl Lindaman and Maddie Houlihan recorded 3 RBIs as Sara Groenewegen allowed one hit and two walks with 12 strikeouts over 6 innings. 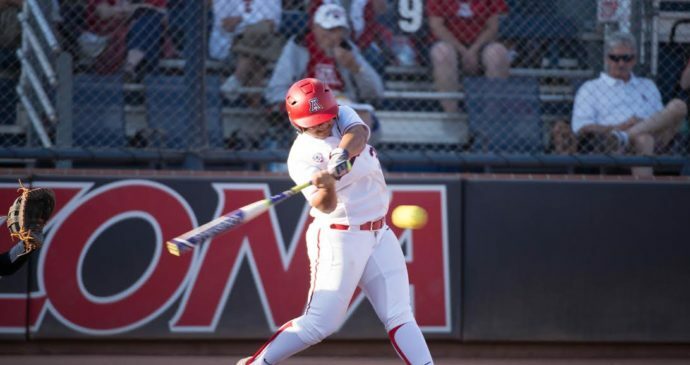 Fresno State had a strong 5-0 win over New Mexico to keep a few streaks alive. Kierra Willis went 2 for 2 with 2 RBIs with one in both the fourth and fifth innings as Lindsey Willmon had a 2 for 3 day with 2 RBIs and 2 runs scored. Kamalani Dung went seven innings, allowed three hits, and struck out 7 batters. The win gave Fresno State their 30th of the season, which marks their 36th straight season with at least 30 wins. It also kept their Mountain West title hopes alive. #FresnoState extended its nation-best string of 30-win seasons tonight. The Bulldogs have won 30 or more games for 36 straight years. A day after clinching a share of the Big 10 title, #4 Minnesota won it outright with a 14-1 victory over Penn State. Six first inning runs propelled the Gophers to the victory as Dani Wagner went 3 for 3 with 4 RBIs and 3 runs scored. The duo of Sara Groenewegen and Allie Arneson had 2 RBIs and Minnesota reached 50 wins for the first time in program history. The Big 10’s second place team, #19 Michigan, blew the doors off Rutgers with 6-1 and 19-1 wins. The Wolverines put the 25 runs on 34 hits led by Aidan Falk’s 4 for 7 day with 3 RBIs and 3 runs scored and Katie Alexander going 2 for 3 with 5 RBIs and 2 runs scored in the second game. Tera Blanco had 4 RBIs on the day while picking up the win in game two. Oregon State upset #10 Utah for the second consecutive day. Utah led 1-0 after five following BreOnna Castaneda’s solo home run. The Beavers tied the game in the sixth on an error and then took the lead via a two run infield single by Shelby Weeks. Taylor Cotton went all seven innings allowing one run on two hits and five walks as Oregon State won 3-1. #5 Oregon defeated #2 Florida State twice in a doubleheader in Eugene. Game one was an 11-0 win as the Ducks got to Meghan King early and knocked hour in the third inning. Oregon scored five runs apiece in the third and fourth innings with equal production across the lineup with seven different batters recording an RBI. Game two was much more competitive as FSU took a lead early in the contest on Carsyn Gordon’s RBI single. Jessica Burroughs held Oregon scoreless until the sixth inning when the Ducks scored quickly. Mia Camuso tied the game with a double and Jenna Lilley made it 2-1 on a single. They added a third run and Maggie Balint set the Seminoles down in order in the top of the seventh. Stanford defeated #7 Washington handily with Kiana Pancino throwing a one hitter. The Cardinal were led by Whitney Burks 2 for 4 day with 4 RBIs and Kristina Inouye going 4 for 4 with 2 RBIs and 2 runs scored. #12 UCLA shut out #3 Arizona for the second straight day. Madeline Jelenicki opened the scoring with a three run shot in the bottom of the first and Kylee Perez added a two run shot in the fifth. Jelenicki drove home a fourth run on a sacrifice fly as Selina Ta’amilo improved to 13-0 after allowing 3 hits in 4 1/3 innings. #9 Auburn took their first series ever in Tuscaloosa as they defeated #14 Alabama 4-1. The game was scoreless until the fifth when Carlee Wallace walked with the bases loaded. Alyssa Rivera cleared the bases with a 3 run double while the Tide were able to only get one back in the sixth. #6 Oklahoma finished off the regular season in style with a combined no-hitter from Nicole Mendes and Paige Lowary. The Sooners only scored one run, a solo shot by Mendes in the sixth inning. Lowary ended up with the win after pitching 4 1/3 innings of relief to improve to 13-2. Northern Iowa played two against Illinois State and took both contests to close the gap in the Missouri Valley to one game between the teams. The Panthers outscored the Redbirds 19-3 over the two games with Kennedy Bailey hitting a grand slam and three run home run in the first game. Macey Wolfe (3 RBIs), Ashley Chesser (2 RBIs), and Sammy Bunch (2 RBIs) led the offense in the second game with multiple RBIs. Despite missing out on the Big 10 regular season title, #19 Michigan ended the regular season with a dominant 20-0 win over Rutgers for the sweep. The offense was on fire getting 19 hits and 7 different batters recording multiple RBIs. The duo of Megan Betsa and Tera Blanco combined to throw a no-hitter with each allowing one walk. Fordham destroyed La Salle 12-1 in five innings to clinch their fifth straight Atlantic 10 title. The Rams took a 3-0 lead after two innings and led 3-1 after three before their 8 run outburst in the fourth. Chelsea Skrepenak went 2 for 3 with 5 RBIs including a grand slam in the fourth inning. Northern Iowa, needing a sweep of Illinois State on the road to win the Missouri Valley title, won 8-2 over the Redbirds to win their first title since 2012. The Panthers led 3-0 after the top of the second and never looked back. Sammey Bunch had 3 RBIs and Bailey Lange had 2 RBIs. UNI is rewarded with the #1 seed in the MVC Tournament, which will be right back in Normal, Illinois, home of the Illinois State Redbirds. #11 Tennessee won 8-6 over #8 Texas A&M to take the series after falling in game one. The game went back and forth with Tennessee leading 1-0 in the top of the first, the Aggies took a 2-1 lead on Tori Vidales in the bottom of the first, and Meghan Gregg gave it back to the Vols in second on a grand slam. Vidales hit another home run in the third and the Vols expanded the lead to 8-3 after six. It was Vidales again in the bottom of the seventh that closed the deficit to 8-6 on her third home run of the game, but the Aggies were unable to score again. Vidales went 3 for 4 with 6 RBIs and 3 runs scored and Meghan Gregg went 2 for 4 with 5 RBIs for the Vols. #14 Alabama defeated #9 Auburn to prevent a sweep in the regular season finale for both squads. Auburn loaded the bases in both the first and second innings, yet came away with zero to show for it. Haley Fagan broke through for the Tigers with a solo home run in the top of the third before the Tide hit back for three in the bottom half. Gabby Callaway brought a run home on a single and Marisa Runyon doubled home two runs in back-to-back at bats. Fagan closed the gap to 3-2 with another solo shot in the fifth. #3 Arizona won 7-2 over #12 UCLA as they clinched the Pac-12 Regular Season title and the conference’s automatic bid to the NCAA Tournament. The Wildcats put up four in the top of the first via Jessie Harper’s grand slam and then added three more in the third. 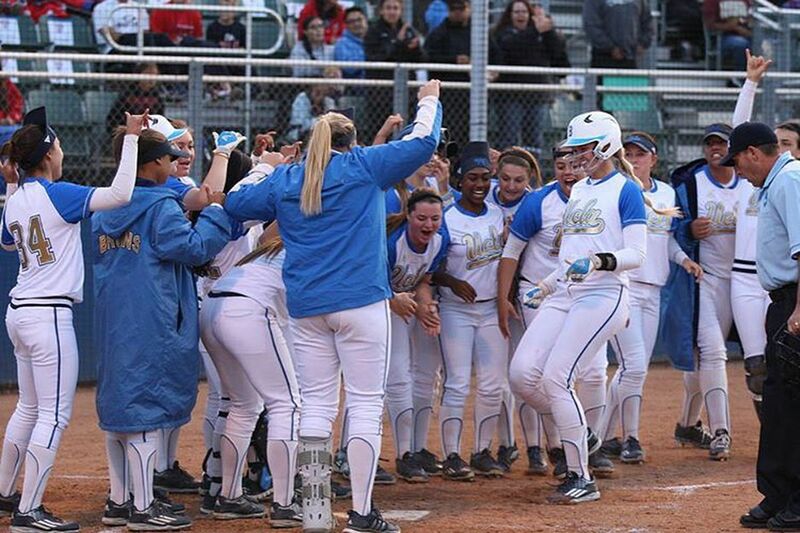 The Bruins were able to scratch up two runs and Danielle O’Toole threw the complete game. #5 Oregon swept #2 Florida State with a walk off 2-1 win. The Ducks and Seminoles were tied at one going into the bottom of the ninth where Danica Mercado led off with a double. Two batters later, Gwen Svekis brought Mercado home on a sacrifice fly. With April officially over, we are closing in fast on conference tournaments as well as the NCAA tournament. Week twelve had few surprises and we take a look at the top 16 teams in our power rankings as well as the next four teams. We will start by providing last week’s rankings below. Please note the records in the table below are as of April 25. Below is the eighth edition of our 2017 power rankings. Please note the records listed are through games as of May 2. The Gators (#1 last week) had a three game set on the road at Tennessee and took two of three. The first two were shutouts in which the Florida pitchers only allowed five hits. They dropped the final game 5-1 as the Vols got to Aleshia Ocasio for nine hits. 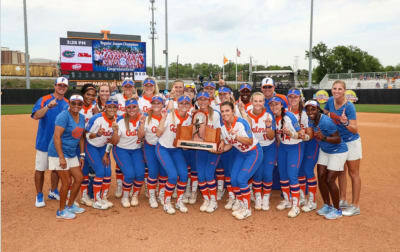 After the second win, the Gators clinched the SEC regular season title for a third straight season. The Gators, like most teams, have a final week of games before their conference tournament. They start with a massive road game versus Florida State on Wednesday followed by North Texas for a three game set over the weekend and Florida A&M on Sunday afternoon. Arizona (#2 last week) stays in place after taking two of three from in state foe Arizona State. The Wildcats won 4-3 in the opener in a back and forth game. Game two was a solid 5-2 win for the Sun Devils as they took a 5-0 lead before a late two run home run by Katiyana Mauga. The final game was all Arizona with Danielle O’Toole allowing only one hit and Jessie Harper going 3 for 3 with 5 RBIs. The Wildcats are closing in on a Pac-12 title, but have one final series at UCLA this weekend, which will not be easy. Oklahoma (#4 last week) swept Texas Tech over the weekend with the final two games being double run blowouts. The won the opener 4-2 with four different players batting in a run. The final two games were 12-0 and 14-3 wins with Shay Knighten going 5 for 7 with 9 RBIs and 5 runs scored. The Big 12 is on the line as they face second place Oklahoma State three times between Wednesday and Saturday. Minnesota (#5 last week) had another strong week going 5-0 with sweeps of North Dakota State and Purdue at home. Sara Groenewegen went 3-0 pitching 17 1/3 innings giving up six hits and 4 walks while striking out 34. She threw a no-hitter against Purdue in the series opener and improved to 25-2 on the season. Kendyl Lindaman had a big week going 8 for 13 with 10 RBIs, 8 runs scored, 5 walks, and 3 home runs. The Gophers face Penn State on the road over the weekend with the Big 10 crown nearly in their grasp. They hold a two game lead over Michigan in the standings. The Seminoles (#6 last week) went 3-0 over North Carolina to complete a perfect ACC season. The Seminoles pitching came back to life as they allowed just six hits over the three games with Meghan King allowing three hits over 13 1/3 innings. Florida State’s regular season ends with a bang facing Florida at home on Wednesday and then traveling to face Oregon for a three game set. Texas A&M (#3 last week) went on the road to Kentucky and lost two of three. The Aggies pitching was not as effective as normal. They allowed at least six hits in each game and the defense committed three errors over the series. The two losses, combined with Florida’s two wins, cost the Aggies a (slim) shot at the SEC title. The final series for Texas A&M is at home to Tennessee. Washington (#8 last week) went on the road and swept California. The Huskies relied heavily on Casey Stangel and Taylor Van Zee over the series as they combined for 9 RBIs. Washington has four games at home this week starting with Seattle on Wednesday and Stanford over the weekend. Oregon (#9 last week) had an easy sweep of Oregon State winning the three games by a combined score of 22-2. The pitching and hitting was firing on all cylinders against Oregon State. The Ducks allowed only 8 hits while tallying 22 hits of their own. The potential for a great series looms this weekend as they welcome Florida State to Eugene. Tennessee (#7 last week) welcomed Florida to Knoxville and they fell in two of the three contests. The first two games were tough for the offense as they were only able to muster five hits against the dominant Florida pitching. The third game was a breakthrough for the Vols as they won 5-1 thanks to a grand slam from Megan Geer. Taking a game from the Gators was good for the Volunteers and should keep their confidence up. They face Texas A&M on the road this weekend. Utah (#10 last week) had a bit of a strange week. They were scheduled to play Wednesday against Weber State, but weather forced a cancellation. They did not play over the weekend, but did face Grand Canyon twice at home on Tuesday. Game one was over early as they put up 7 first inning runs en route to a 9-0 win. Seven different batters recorded an RBI in the victory. Game two was not as easy with the game tied at zero going into the seventh. BreOnna Castaneda’s three run shot ended the game while the duo of Miranda Viramontes and Katie Donovan combined to allow only one hit. The Utes have a road trip to Corvallis to face Oregon State this weekend. They have an outside chance of winning the Pac-12, but need Arizona to falter and then the Utes need sweep their remaining Pac-12 games. The Tigers (#11 last week) went 4-0 with a win over Alabama State and a sweep of Mississippi State. The win over Alabama State was a 14-1 shellacking with four different Tigers recording multiple RBIs. Against the Bulldogs, Carlee Wallace had 5 RBIs and Casey Cooper went 4 for 7 with 3 RBIs. As the Tigers continue to move past the recent issues, they loom a threat going into the SEC Tournament and beyond. They face rival Alabama on the road this weekend. UCLA (#12 last week) went 4-0 with wins over Cal State-Northridge and a sweep of Stanford. The offense was on fire as they scored 32 runs on 47 hits with Kylee Perez going 10 of 18 including a five hit game versus Stanford. The Bruins have a tough weekend matchup against Arizona at home. Louisiana-Lafayette (#13 last week) swept Coastal Carolina with all three games ending after five innings. The Ragin’ Cajuns won the Sun Belt regular season title as a result of the sweep. Lexie Comeaux had a super weekend going 4 for 7 with 11 RBIs, 5 runs scored, and 4 walks. The Ragin’ Cajuns only hit two home runs over the weekend despite scoring 30 runs, which makes them an even more dangerous team going forward. Their final regular season series is at Louisiana-Monroe over the weekend. Baylor (#14 last week) took two of three from Oklahoma State at home. The Bears won 5-1 and 7-3 in the opening two games before dropping the final game 9-4. Kyla Walker did a fantastic job of getting on base going 8 for 10 while the duo of Ari Hawkins (5 RBIs) and Shelby Friudenberg (4 RBIs) brought the runs home. Baylor’s final regular season series is against Texas. They will play one game at home and the other two at Austin. It was a very good week for James Madison (#15 last week) going 5-0. They swept North Carolina in a midweek doubleheader and Drexel over the weekend. The sweep of Drexel gave the Dukes the Colonial regular season title. Odicci Alexander threw a two hitter against North Carolina and a three hitter versus Drexel. Megan Good won 2 games against Drexel and is now 31-1. The Dukes face Elon at home over the weekend in their final regular season series. Michigan (#17 last week) move into the top 16 after going 4-0. They swept Indiana over the weekend allowing just two runs against the Hoosiers. They also took care of Western Michigan 8-0 on Tuesday in five innings with Tera Blanco pitching a three hitter. Michigan has a final Big 10 series at Rutgers over the weekend before the conference tournament begins on May 11. Ole Miss (#18 last week) had a good week going 3-1 a win over Jacksonville State and two wins against Alabama. The Rebels walked off against JSU with a 2-1 win before struggling against the Tide in the opener. They managed only one hit in that game before coming back to win the next two. They won 2-1 and 5-4 over Alabama with both ending via walk off. Ole Miss has been on the good side of the walk off wins the last two weeks with five such occurrences. Can they keep those up in the coming weeks? They face Southern Miss on Wednesday and then go to Missouri for the weekend. Alabama (#16 last week) lost two of three to Ole Miss as noted in the preceding paragraph. They had the lead in the seventh inning in both losses, but saw the games slip away. Since their series against Missouri at the start of April, the Tide have gone 8-9 and have taken only 1 series, which was against LSU. Alabama’s slide is worrisome heading into the post season and they will be at home to Auburn to end the regular season. LSU (#19 last week) took two of three from Missouri at home. The magic number to win in that series was 3 as all three games ended with the winning team scoring 3 runs. LSU won 3-2 and 3-1 in the first two games while Missouri won 3-1 in the series finale. LSU will be a tough out for any opponent even if they are on the road. They will play at South Carolina this weekend. BYU has been on a roll since late March when they lost three in a row to the combination of UCLA and Oregon. They have won 15 in a row and this past week saw them going 4-0 with all ending early due to the run rule. They scored 42 runs and gave up only five including 30 against San Diego (gave up one to USD). Rylee Jensen and Caitlyn Larsen Alldredge both recorded 5 RBIs in separate games with Jensen finishing with 9 RBIs for the weekend. BYU will take on Grand Canyon on Wednesday, Santa Clara over the weekend, and Utah State on Tuesday. Arizona State, California, Georgia, Illinois, Jacksonville State, Kentucky, Marshall, Missouri, North Carolina, Ohio State, South Carolina Upstate, Texas State, and Tulsa.